minute drive from our house. 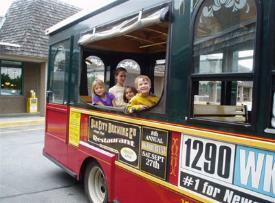 simple late morning excursion with our kids on the Keene trolley. windows are rolled all the way up in the warm weather. The seats are wood. down to our local Hannaford’s supermarket to wait for the 11:35 a.m. trolley. younger ones) when the trolley made the turn into the parking lot. blowing through my hair and seeing the familiar scenes through different eyes. us in it with each turn the driver took. was not a doomsday ride. transformed three decades later into a regional marketplace. birthday money from grandparents, made some modest but happy purchases. food and atmosphere. Sometimes they even have live piano music. is Chinese food and I ordered a plate of dumplings for us to share. several retail shops and an excellent ice cream shop, Rick’s Gourmet Ice Cream. p.m. “It wouldn’t have been the same if we took our cars,” she said. And I agree. Heart of New England online magazine.